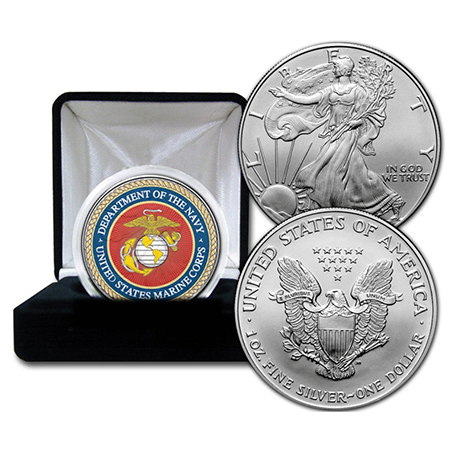 The United States Marine Corps Commemorative Coin Makes a great gift for kids, patriots and coin collectors, the painting in this piece of art is intricately detailed and the obverse side is the mint condition Great Seal of the United States, as on all Kennedy half-dollars. The coin comes sealed in a hard shell, cushioned plastic case which can be opened for closer examination of the coin. Painted over top of the face of a real Kennedy half-dollar is the official seal of the United States Marine Corps. The traditional Eagle, Globe, and Anchor emblem in gold, with the Globe and anchor rope in silver. The eagle is depicted with wings displayed, standing upon the western hemisphere of the terrestrial globe, and holding in his beak a white ribbon bearing the Marine Corps motto "Semper Fidelis" (Always Faithful) with the hemisphere superimposed on a fouled anchor. An American Bald Eagle replaced the crested eagle depicted on the 1868 emblem.